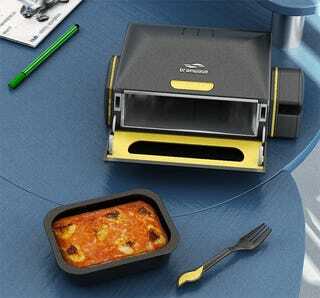 Much to my growling stomach's dismay, the BrainWave desktop microwave is only a concept and not sitting next to my keyboard. Guess I'll have to walk all the way to the kitchen to heat up a meal after all. The appliance [...] is controlled through a computer application connected via USB. A RFID-tagged plastic spoon comes along with specially packaged meals and scanning the tag transmits the meal info to the microwave. This in turn auto sets the heating time.